Were the Picts related to the Celts? Were the Picts their ancestors? The Picts, who were older than and coexisted with the Celts, called themselves Cruithneach or Cruithne/Cruithen, which meant shape or appearance. I am really glad to know that their original name survived through the years. Could it be that the word Celt was how the Greeks heard and understood the term Cruithneach or a derivative of it? I guess we'll never know. The Celtic people might have arrived in Great Britain a little later than the Picts, who made up the Northern Scottish tribe that became their neighbors for a thousand years or so. 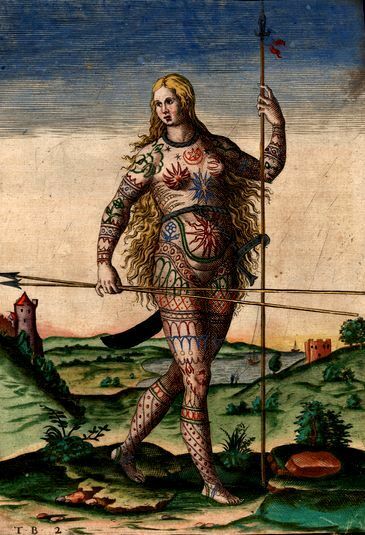 Their Latin name was given by Roman historians from the plural picti, which meant "the painted ones," indicating that they might have painted their faces and bodies, or might have sported tattoos. Celtic and Pictish designs have similarities. The Celts knew how to extract blue ink from woad, while the Pictish druids covered their bodies with blue paint during wars. The Picts also used blue woad to adorn their faces and bodies with intricate images of birds, beasts and mysterious geometric designs. They were probably the first to create the perplexing knotwork designs that we recognize today as Celtic. Some of the more popular tattoo designs today are from the Pictish Symbol stones. This ancient people have been illustrated as uncommonly tall, with fair or yellow curly hair. They were bright or blue-eyed, according to Tacitus and Caesar. Celtic and Irish folk tales and mythology also described this brave tribe as having these features. Roman historians wrote that the men were muscular, with painted or tattooed faces and bodies. Ancient burial sites also revealed evidence that most men and some women knew how to use dangerous weapons of war such as swords and spears. The Celts have also been characterized by foreign (non-Celt) historians as confident, fearsome and courageous in battle. Women were independent and physically robust. They were equally courageous and did not hesitate in joining their husbands, brothers and fathers in fighting battles. Celtic bravery and expertise in warfare were reported by almost all ancient historians. This is probably why many politicians hired them as mercenaries in the manner that Dionysius of Sicily employed the Celts to do damage in Greece in 369-68 BCE. Ptolemy Soter, a general of Alexander the Great, wrote around 335 BCE that Alexander encountered a band of Celts settled near the Adriatic. Alexander asked them what they feared most. They replied coolly that they feared nothing, only that the sky might fall upon them. Now is that any way to talk to THE Alexander the Great? :-) Their casual reply can be traced to the vow of Conchobar's Irish warriors prior to the last battle of the Tain Bo Cuailnge, or the Cattle Raid of Cooley. Many folk traditions and mythology have also been preserved in Britain and Ireland. These are wonderful epics of heroes, fairies and noble quests, with some of the heroes believed to be the ancestors of British or Irish kings. Other Greek and Roman writers also recorded the fable of the druids, who declared their ancestors' ability to fly through the ages by transforming into birds (De mirabilibus sacrae scriptorae, 655 CE). The Greeks and Romans, who definitely cannot fly, thought this preprosterous, of course. If they could not do it, then no one else could and no one else may. Nevertheless, this druid proved the early Celtic belief (or perhaps practice?) of shapeshifting, which is mentioned countless times in their myths and legends. The more famous stories and myths that are accepted as truly Celtic include Tain Bo Cuailnge (the Cattle Raid of Cooley), the adventures of Connla the Fair, Canu Aneirin, Canu Taliesen, Cu Chulainn and the stories of the Ulster Cycle, the epics of Fionn Mac Cumhaill and Fionna, and the Arthurian legends from the Welsh Annals. You can learn more about the history of the Celts here. Read more about the origin of Celtic symbols and their mysterious artwork. Their druids and spirituality will also fascinate you! You can also return to the main Celtic Symbols page or the Symbolisms homepage.